Coulrophobia, the fear of clowns, is one of the most common phobias that people have. It’s right up there with fears of spiders, heights, and even death. We can see why – who came up with the idea that weird, distorted faces covered in garish makeup could ever be anything other than horrifying? Fortunately, we’re fans of horror, too. And clown costumes are always a big hit at Halloween, mostly because so many people hate clowns. Obviously, the most popular deranged clown characters that people tend to take inspiration from are Harley Quinn and Joker – check out those links to learn more. But, for this list, we’re going for something a little bit more sinister – we’re talking about pure, unadulterated nightmare fuel. So, who are the creepiest clowns of all time? If you’re looking to put together a scary clown costume for Halloween, then let this list serve as the ultimate inspiration. 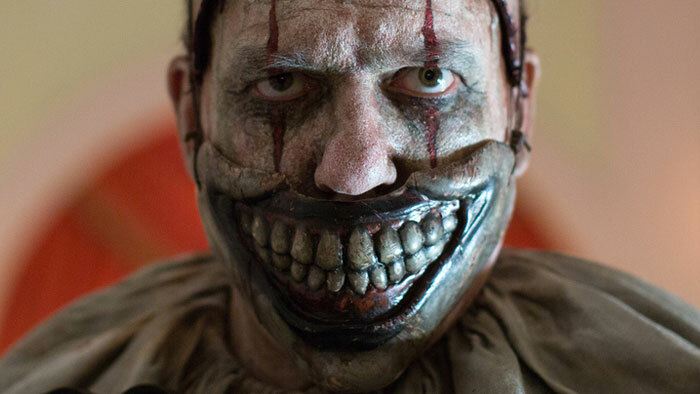 As one of the main antagonists from the fourth season of American Horror Story, Twisty is definitely one of the most popular scary clowns from recent years. Originally a mild-mannered (but still super creepy) circus clown, Twisty attempted to shoot himself in the mouth with a shotgun after the other carnival workers drove him away. 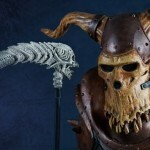 This left his jaw mangled and mutilated, an injury which he covers with a grinning mask. 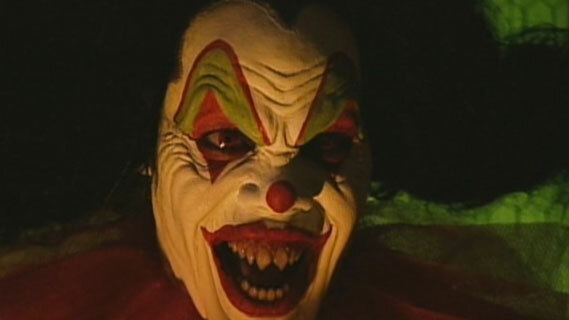 In All Hallows’ Eve, Art the Clown is a demonic and homicidal clown that only appears on Halloween night to wreak havoc. 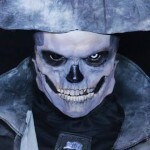 Part of what makes Art look so scary to us is his stark black and white makeup. 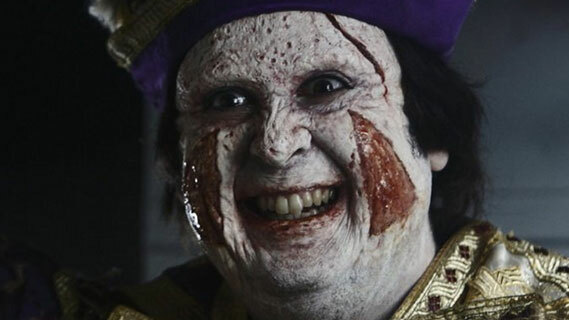 Almost mime-like in appearance, his face only sees splashes color when the blood of his victims splatters across it. Director Damien Leone has also made two other horror films featuring the Art the Clown character, though they’re not technically bound together as one series: The 9th Circle (2008) and Terrifier (2011). Want to know what’s even scarier than a scary clown? A scary clown… on fire. 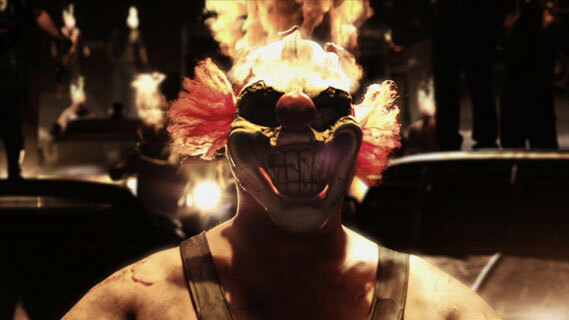 Twisted Metal is a series of combat driving games that first debuted in 1995. Basically, every stage is a massive demolition derby, complete with weapons galore and legions of bloodthirsty enemies. The last driver standing wins. Sweet Tooth has been the face of the franchise forever. 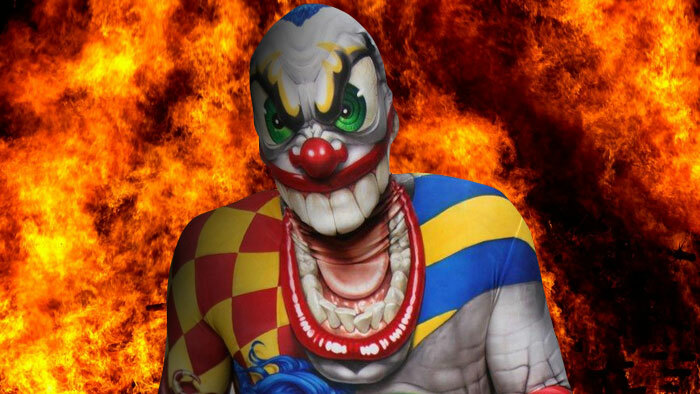 He drives an armored ice cream truck, and his backstory explains that he’s “a circus clown who has escaped a mental institution.” His flaming mask and classic clown makeup is one of the most intimidating sights in the game, and one of the most popular ones among fans. The Last Circus (or Balade triste de trompeta) is a Spanish film that tells the story of two circus clowns whose personal rivalry over a woman’s attention leads them down the path of insanity. In a more extreme version of the “Why so serious?” scene from The Dark Knight, one clown savagely beats the other with a trumpet and gives him a Chelsea grin. The other clown sears his own face with lye, to turn his skin white, and uses an iron to permanently burn scars in the shape of clown makeup onto his cheeks. This one is a definite must-see for horror fans, but it’s probably not a great date night movie. Time to balance things out with something a little sillier. 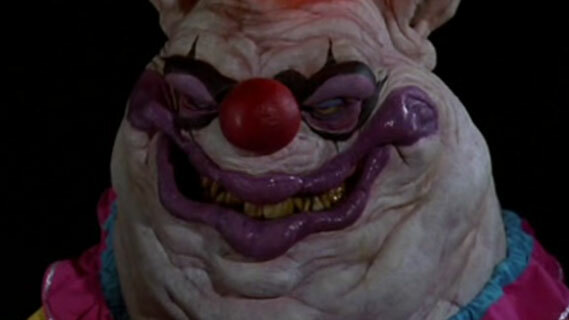 Killer Klowns is an ’80s B-movie that’s pretty much exactly what the title sounds like. Aliens (that look like clowns, because otherwise it wouldn’t make any sense) arrive on planet Earth, dead-set on the eradication of the human race. The thing that makes this movie really ridiculous, firmly cementing it as “so bad, it’s good” masterpiece, is that the Klowns exclusively use circus-themed methods of execution (cotton candy death rays and deadly popcorn guns are just two of them). There aren’t any of those spongy orange peanuts, though, which is weird, because trying to eat a bag those is like torture. 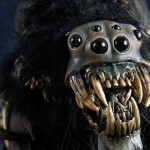 The Killjoy series is another B-movie horror franchise, debuting as direct-to-video in the early 2000s. It’s not really “so bad, it’s good,” like Killer Klowns, though. It’s kind of just “so bad.” With a tagline like, “He’s not clowning around…” you know exactly what you’re getting into. We’re not here to critique the movies, though; we’re here to talk about the costumes – and they’re pretty sick. Bright red eyes, green makeup, and gnarled, pointed teeth make Killjoy one of the scariest clowns that there is, at least visually. In Rob Zombie’s horror film House of 1000 Corpses, Sid Haig plays Spaulding, a crazy cartoon character that derives enjoyment from death. He’s almost happy-go-lucky when it comes to killing, which honestly makes the whole thing even creepier. His penchant for violence isn’t actually explained, even though he kills a couple of burglars that try to rob his gas station. He directs the main characters of the film to the Firefly family of killers, of whom Spaulding is revealed to the leader, in The Devil’s Rejects. This one might be a little bit out of left field if you’re not big into video games, but just trust us. 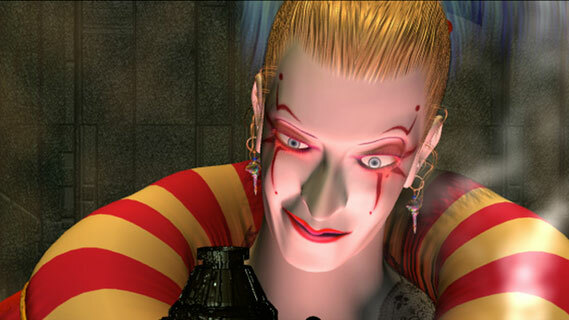 On the outside, Kefka looks like a Medieval or Renaissance court jester, complete with period costume, white makeup, and just a hint of crazy eyes. 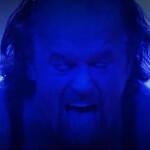 On the inside, he is nihilistic, psychopathic, and legitimately insane. Fortunately, and especially when combined with the creepy outfit, these are some of the best personality traits a video game villain can have. In Final Fantasy VI, Kefka’s reign of terror includes events such as murdering his emperor to overthrow the kingdom, murdering an entire town with poisoned water (just for funsies – yes, really), and murdering about half of the planet’s population when he actually succeeds in his classic bad guy plan of destroying the world. You knew we weren’t going to leave out the classic, holy grail of creepy clowns. 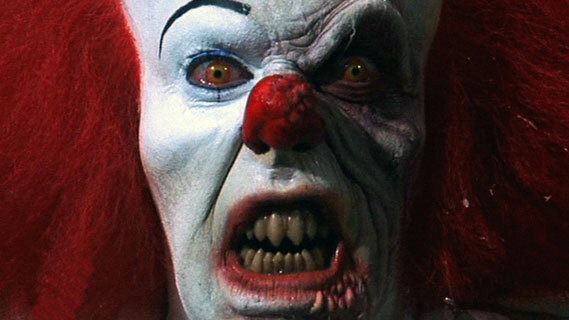 Master of horror Stephen King created Pennywise in one of his best-known works, the 1986 novel It, and Tim Curry’s portrayal of the character in the 1990 miniseries is what really started to popularize the whole “scary clown” trope. One common misconception about Pennywise, though, is that it’s the actual monster in the story. The “It” monster is a nebulous, shape-shifting being, and Pennywise is just the form it uses to lure children into its fangs. If you liked this post and want to see more like it, let us know which costumes and characters we should talk about next. Share your thoughts with us on Facebook and on Twitter @BuyCostumes, and check out our Pinterest boards for more costume ideas, too. 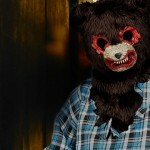 Shop clown costumes on BuyCostumes.com. Shop all adult costumes on BuyCostumes.com.